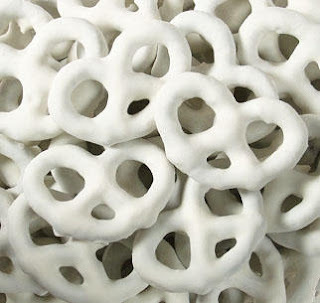 Creating your own white chocolate covered pretzels at home is easier than you think. With a few store bought ingredients and a little time, you can make some designer looking treats to share with your family and friends. *Important to use candy melts or wafers since they do not require tempering like some other chocolates and are perfect for beginners to use. Before starting to make these treats, please make sure that you have a large enough work space to spread out your dipped rods. Prepare your cookie sheets or counter top by covering them with parchment paper. Empty the candy melts into a microwave safe container and place in the microwave for 30 seconds. Stir the candy melts. Place back in the microwave for 10 second intervals until the chocolate is completely melted. It will be super hot so be careful. Let stand for a couple minutes before dipping your treats. Place all of your pretzel rods into a bowl on one side of the counter and place the melted chocolate next to it. Tilt the melted chocolate bowl at an angle so that you can dip them in as deep as you want the chocolate to coat it. Turn the pretzel gently in the melted chocolate to make sure you coat all sides. Remove chocolate coated pretzel from the melted chocolate. Gently tap it on the edge of the bowl to less the excess chocolate drip off. Immediately place onto the parchment covered cookie sheet or counter top. Repeat until all rods have been coated with melted chocolate making sure to leave a little space between each chocolate dipped pretzel rod. If the chocolate hardens before you are finished, place the bowl back into the microwave and repeat the melting instructions. Let set until the chocolate is completely set before moving or packaging. Note: These treats are so easy to make using mini pretzel rods or pretzel dipping sticks. They can be individually wrapped up or put into cellaphane bags by the 1/2 dozen or dozen as part of a gift basket. They can also be made ahead and frozen. In a microwave safe container, mix the bag of caramel bits together with the whipping cream. Heat in the microwave for 30 seconds and then in 10 second intervals until the caramel has completely melted and is smooth. It will be super hot so be careful. Let stand for a couple minutes before dipping your pretzels. Take one of the pretzel rods and dip it gently into the caramel mixture at an angle. Don't do this too fast because you may break the rod. Gently swirl the pretzel rod in the caramel mixture until coated. Place pretzel rod onto parchment paper to dry. Keep repeating until all your pretzel rods have been covered. Place caramel back in the microwave to re-melt as necessary. Once all of the caramel coated pretzels are dry, continue with the instructions above regarding microwaving the candy melts or wafers so that you can dip the caramel covered rods into the melted chocolate. You can dip the rod so that you completely cover all of the caramel or you can leave some of the caramel exposed. Either way these treats will disappear quickly.